What about the 12% gain Kurt realized on ALTR after we showed a profit of only $0.05? 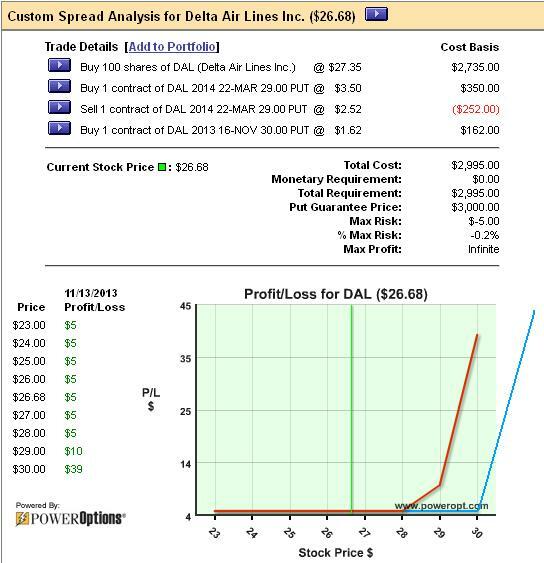 The -$0.05 guaranteed profit, or bulletproof status, meant that even if ALTR dropped to $1.00 per share he was still guaranteed to make $0.05, even though his cost basis was $29.95 getting into the position. This Delta RPM has a similar risk-reward profile to the ALTR trade. This RPM is now BULLETPROOF. Similar to the ALTR position. As you can see from the image, the ALTR position (shown as using Delta with the same numbers in the current market) has no chance for loss. The 30 strike put option guarantees that we are going to get a minimum of $30.00 back for the position. Since the cost basis is lowered to $29.95, we are guaranteed to make $0.05 even if the stock drops to $1.00 per share. 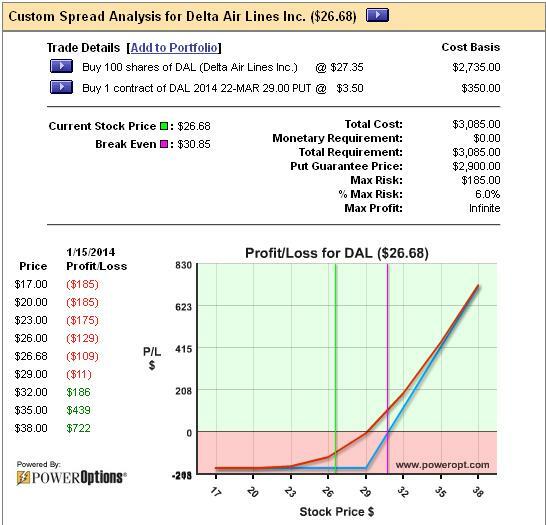 Total Gain on ALTR = $ 3.15, or a 10.5% return from the total cost into the position of $29.95. Kurt also made an additional $0.70 on the RPM using an IM #5 trade in October that increased the total profit to $3.85 / $29.95 = 12.8% return. The $0.05 guaranteed profit was the worst case scenario. Kurt still had unlimited upside. The more important thing than the return in this case was the fact that Kurt entered into an earnings event knowing he could not lose…but still had the advantage of upside profit potential. Heads you win, tails you don’t lose! how can one subscribe to your services? how much is it? Hi Jules: The Fusion service on RadioActiveTrading.com is $69 per month – teaches and supports the trading methodology that we teach in The Blueprint. If you are more advanced, consider a subscription to PowerOptions – these tools will help you find our style of trading and then manage it once you are in a position. Can we purchase the custom spread builder with graph software? James, you subscribe to that service. My Question: How is it possible for the MAR 29 put to be priced higher than the NOV 30 put when the MAR 29 put has less time value and the strike is lower?